Raids is a game by Matthew Dunstan and Brett J. Gilbert, published by IELLO. It is for 2-4 players. In this game, players take on the role of Viking captain as they guide their Longship full of the bravest warriors on a fantastic voyage full of adventure. Of course they’ll have to fight off horrible monsters as well as battle other Viking ships to gain Glory and riches beyond their wildest imaginations. They’ll also need to do some recruiting, as well as collecting and trading valuable goods if they hope to survive the turbulent seas. In the end, the captain that can best command their crew will be declared the winner. To begin, the board is placed in the middle of the play area. Each player will choose a color and take the corresponding Longship marker and player board of that color, placing them in front of themself. The Viking pawns are placed on their space in the middle of the board. The coins are placed near the board in a pile. The Voyage tiles are sorted into separate face down stacks based on the numbers on the back of each one. These stacks are placed near the board. The Voyage 1 tiles are shuffled together and placed face up on the designated spaces of the board, starting with the space immediately after the Harbor space and continuing around the board by following the arrows. Coins are placed on Pillage tiles and Viking pawns on Visit tiles as shown on the particular Voyage tile. The Harbor tile with the red ship on the back is placed on the Harbor space on the board. The remaining Harbor tiles are shuffled together. One tile is placed face up next to each stack of Voyage tiles. The remaining Harbor tiles are returned to the box, not to be used during the game. The first player is chosen. Each player in turn order, starting with the first player, places their Longship marker on the starting spaces of the board, going from 4 to 1. Starting with the first player and going clockwise in turn order, each player will take a number of Viking pawns, as noted in the rulebook. The number of pawns varies by player and number of players. Players place their Viking pawns on their Longship board, one pawn per Shield space. A number of Viking pawns are then placed in each of the Villages on the board. This number is equal to the number of players. Three Viking pawns are then placed on the “Visit” Voyage tile. Once all this is done, play now begins. The game is played over 4 Voyages. Each Voyage consists of several consecutive turns, until all of the players have returned to the Harbor tile. Turn order is based on the player that has the Longship marker the furthest behind. At the beginning of the game, this would be the player on the number 4 space. Each player’s turn consists of 2 steps or phases; take a Voyage tile and Navigate. The first step is to take a Voyage tile. At the beginning of the game, this step is skipped. To do this step, the player simply takes the Voyage tile that their Longship marker is in front of, placing it on or beside their Longship board, based on what kind of tile it is. Rune and Port tiles are placed near the Longship board while Weapons, Sails, Mjollnir, Pennant and Goods tiles are placed on one of the 5 middle spaces of the player’s Longship board. If there are no empty spaces on the Longship board, the player may discard a previously placed tile or discard the new tile. It should be noted, once a Port tile is placed near a player’s Longship board, they may immediately sell 1 or 2 goods on their Longship and recruit 1 Viking. The sold Goods tile is then placed next to the player’s Longship board. It should be noted, the player is able to move the Viking pawns on their Longship at any time, reorganizing things as they see fit. The next step is to Navigate. To do this, the player must move their Longship marker, following the directions of the arrows on the board. The player may then stop on any Voyage tile, as long as they follow the Rules of Navigation. There are basically 2 Rules of Navigation; Discard all Voyage tiles between you and the next player in front of you and Navigate to the tile you want to visit next. For the first rule, the player must discard all the Voyage tiles between themself and the next player in front of them on the board. These tiles are removed from the game. This means that the player may not stop in front of these empty spaces, they must always catch up to the other players before choosing their next Voyage tile. At the beginning of the game, only the last player to leave the Harbor needs to catch up to the rest of the players. That means that only this last player will discard Voyage tiles. For the second rule, the player navigates by moving their Longship marker around the board, following the arrows. The player may pass as many Voyage tiles as they wish and may stop in front of any Weapon, Sail, Mjollnir, Pennant, Goods, Rune or Port tile left on the board. The player may stop in front of a tile before they reach the Passage, or they may navigate past these locations, stopping in front of a tile on the other side of the Passage. When passing by a Village, Visit or Pillage tile, the player simply takes whatever is shown there. At a Village, the player takes a Viking pawn. At the Visit tile, the first player to pass takes 2 Vikings and the second player to pass takes 1 Viking. At the Pillage tile, the first player to pass takes a 3 coin and the second player to pass takes a 1 coin. Players may also pass in front of Monsters. It should be noted that if the player passes in front of a Monster, they must fight it. This means that they have 2 choices; they may sacrifice a Viking pawn to the monster, placing it back into the reserve, so that they may continue on, or they may fight it by discarding a number of Viking pawns equal to the monster’s strength. Weapons on a player’s Longship will decrease the monster’s strength. Once defeated, the Monster tile is placed next to the player’s Longship board. The player then continues their Navigation as they are not able to stop on a Monster tile. If during the player’s navigation, they choose to return to the Harbor, they will placed their Longship marker on the smallest available number on the starting spaces. This player will not be allowed to take any more turns during this Voyage. The Voyage continues until the last player docks their Longship in the Harbor. If a player stops their Longship marker in front of a Voyage tile without another Longship marker on it, their turn ends. If they stop in front of a Voyage tile that has another Longship marker in front of it, they must begin combat. However, to begin combat the player must have at least 1 Viking on their Longship board. When starting combat, the player must discard 1 Viking pawn from their Longship board back to the reserve on the board. The opponent then has the option to Retaliate or Flee. If they choose to Retaliate, they must discard 2 Vikings from their Longship board to the reserve. This choice then goes back to the attacker who may Retaliate or Flee. For each new Retaliation, the player must discard as many Vikings as their opponent did plus 1. If a player chooses not to, or they simply can’t, then they must Flee. To Flee, the player must immediately leave the tile that they are on without taking the tile or discarding any other tiles. The player must then move their Longship marker to a tile in front of them. This can trigger another combat if the player stops on a tile with another Longship marker already on it, as long as they have at least 1 Viking pawn on their own Longship board. The player’s turn ends once they end their Navigation on an empty Voyage tile or on the Harbor tile. The player whose Longship marker is furthest behind on the board will now become the active player and may then take their turn. This sometimes means that the same player may wind up taking yet another turn. The Voyage ends once all the players Longship markers have made it back to the Harbor tile and are lined up on the starting spaces. Players will now take a Viking pawn from the reserve for each Sail on their Longship, placing it on their board. The player that best fulfills the condition on the Harbor tile will then take a 6 coin, while the second best takes a 3 coin and the third best a 1 coin. As long as this is not the 4th Voyage, a new Voyage begins. The Voyage tiles for the next Voyage are shuffled together and placed face up on the board in the same manner as during setup. Coins are placed on Pillage tiles and Vikings on Visit tiles as shown on the tile. The Harbor tile is then replaced with the one set aside with this round’s Voyage tiles. Viking pawns are placed on the Village spaces equal to the number of players. Once all this is done, a new Voyage begins starting with the player that reached the Harbor last. If this is the end of the 4th Voyage, the game ends. Players add up their Glory points based on Coins, Runes, Mjollnirs, Pennants, Goods and Monsters. The player with the most Glory points is the winner. This game has some really great looking pieces to it. First there’s the board, it’s very detailed with lots of different ports and lands to be discovered. It has some really rich and vibrant colors and images that are quite pretty. Next there are all of the cardboard pieces from the Harbor tiles to the Voyage tiles. The Harbor tiles have spaces on them for each of the Longship markers to be placed while the Voyage tiles have several different things that the players may encounter on their voyage. Each type of Voyage tile has some really cool looking artwork on it that works well with the board and the other pieces. Each cardboard piece is quite thick and sturdy. Speaking of thick and sturdy, the game also comes with some Longship player boards that are made of what appears to be chipboard. These are very good quality and are quite strong. 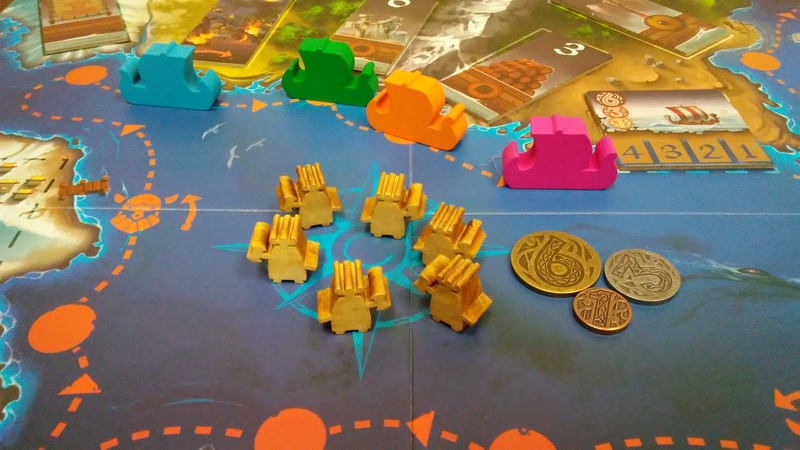 The game also has 4 brightly colored wooden Longship markers that players move around on the board. They look like miniature versions of the Longships. These are great quality. Another set of wooden pieces included with the game are the Viking pawns. These are a natural wood color and are shaped kind of like little vikings. The final pieces included with the game are the coins. These are engraved metal and come in 3 different sizes and color. I noticed that some are a little duller than others and the engraving doesn’t seem as thick on some of the others. Still for a game to have metal coins these days in a retail version is pretty cool. Thematically everything works well together. You get a real sense of the viking world that the game centers around. Looking at everything laid out, it makes me think of the game Champions of Midgard. That’s just probably due to the Viking theme. Overall each piece in this game looks really nice. The artwork is lovely and each piece works well with the others. I’m quite pleased with the overall look and feel of everything. Once it’s all laid out on the table, it’s definitely an eye catcher. The rulebook for this game is very well written and designed. It’s very easy to read and quite simple to follow. The book has plenty of pictures and examples on just about every turn of the page. The first couple of pages consist of explanations of each of the different piece in the game with some lovely looking pictures. The next couple of pages have a full color layout of how the game should look setup along with numbered instructions to guide you through the process. From there the book gets into the meat of the rules, walking you through the summary of a voyage. The Rules of Navigation are laid out in an easy to read format along with some notes thrown in along the way. The last couple of pages consist of pictures and clarifications of all of the different Voyage tiles. Finally on the back page, there are variant rules for 2 player games that involve adding a Ghost Longship that only moves from Village to Village. Also on the back page are some clarifications on the Harbor tiles with explanations of the iconography on these. I will say that there appeared to be a few things that weren’t exactly covered the absolute best though. In fact, I had to head over to BGG to find some clarifications of the rules. That would have been in regards to the Village, Visit and Pillage tiles. Thankfully the designer took time out to explain those oversights. Overall the book looks very nice. I like how quick and simple it was to get through. There are a few things that you’ll most likely have to look back on but everything is laid out in such a way that it’s no trouble trying to find what you’re looking for. Overall I’m rather pleased with the look and feel of the rulebook, minus the minor misunderstandings. Let me start off by saying this, if you’ve ever played Champions of Midgard, this is nothing like that. Public Service Announcement over. Now don’t get me wrong, that’s not to say that this isn’t a good game, it just shouldn’t be compared to Champions of Midgard. Yes, I realize that I pretty much already stated earlier that this game reminded me of that. It’s the theme, merely the theme. Actually this game reminds me, as far as gameplay goes, of Tokaido more than Champions of Midgard. Take for instance the fact that the farthest player back moves first, just like in Tokaido. Your boat, in this instance, must move at least to the next player’s boat if they’re looking for a fight but can move as far ahead of them as they’d like. Add on the fact that you’re adding tiles to your tableau, or Longship in this instance, to be able to gain more points at the end of the game. I think you can see what I’m talking about. The thing is that this game is probably about 20 minutes shorter to play than Tokaido. That’s probably due to the fact that they’re aren’t a whole lot of places to stop at. You simply move around trying to gain the most valuable tiles to add to your Longship. Weapons make it easier to kill monsters. Sails give you more vikings at the end of each voyage. Mjollnirs and Pennats give you glory points at the end of the game. Runes also give you glory points in a set collection sort of way. The more you have the more points you gain. Ports allow you to sell Goods which give you glory points at the end of the game. Monsters also give you glory points but you have to defeat them first. See the game has a bit of set collection mixed in to this whole rondel style mechanic. As you move around, your limited by what actions and tiles you’re able to take. Games like Village, Tzolk’in The Mayan Calendar and Walnut Grove are just a few that use this same mechanic. The thing is, I feel like this game simplifies it a lot better than in some of those other games. This is a pretty simple game to learn and play. This is one that even the kids can play. It’s family friendly without any blood and guts all over the place. I honestly think all the bright colors and the cool looking artwork will make this game appeal to pretty much everyone. 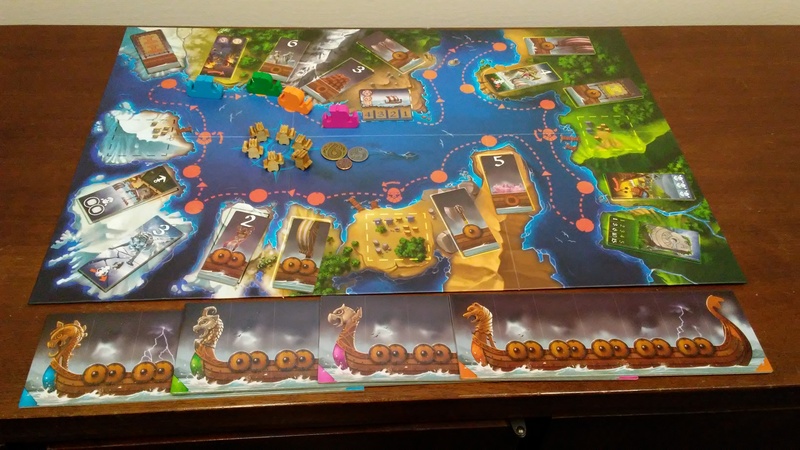 Fans of games with rondel style mechanics or those looking for a fun family friendly viking themed game should look no further than this one. This is a game that I would definitely recommend checking out. 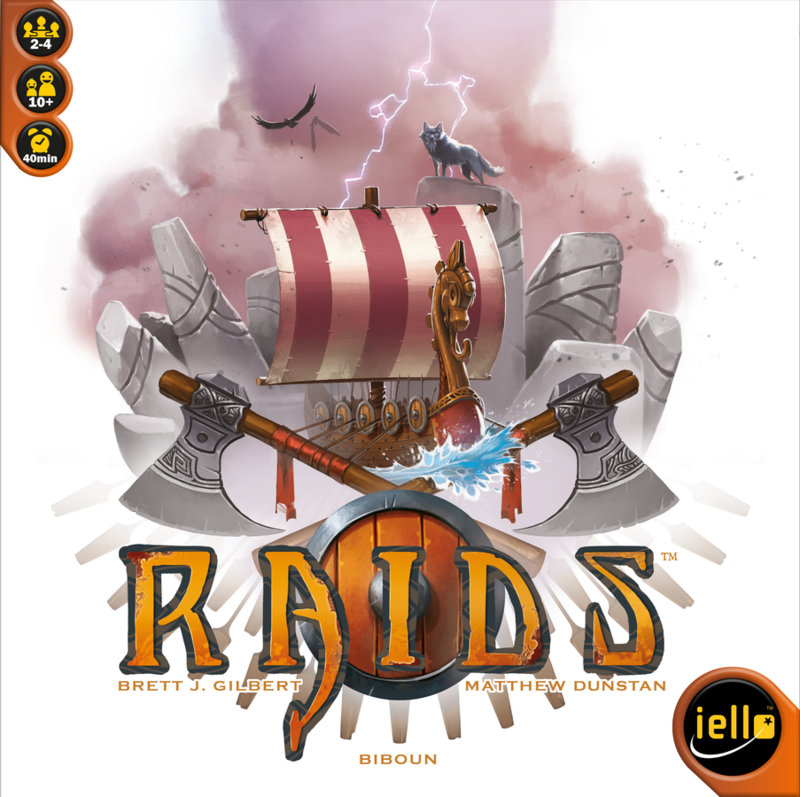 Raids is a rondel style game that encorporates set collection with a viking theme. The game doesn’t take very long. Most game sessions last around 30 minutes or so. The components are great quality and very eye catching. Once it’s set up on the table, people will definitely be drawn to the lovely artwork, metal coins and wooden meeples. The rulebook is really good, although there were a few things that needed some clarification that weren’t there. For the most part though, the book is easy to read through and well designed. The game itself is quite simple and fun. It’s family friendly and one that even the kids can play. There are a few icons that take a bit of time to understand, but it’s really nothing major. The combination of rondel mechanics and set collection make for a interesting game. In some ways the game makes me think of other rondel style game like Tzolk’in The Mayan Calendar, Walnut Grove and Village. The catch up mechanic in the game also feels like the one in Tokaido. Fans of any of these games will most likely find something to enjoy in this one. The artwork should appeal to players of all ages. This is one that I would definitely recommend checking out. Overall, it’s a fun game for the whole family and it doesn’t take too long to play either. Come along Bjorn and Ivar, we have some voyaging to do. This entry was posted in Reviews and tagged board, board games, brett, brett gilbert, brett j gilbert, card, card games, dunstan, games, gilbert, iello, iello games, j, matthew, matthew dunstan, raids, vikings. Bookmark the permalink.